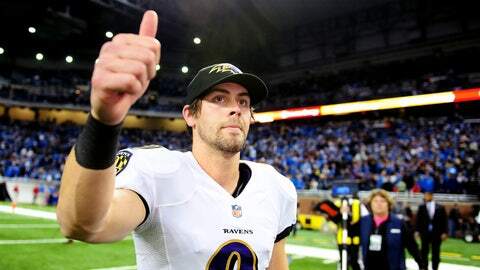 What a week for Justin Tucker: Fame, free soda and The Peter Schrager Podcast! Justin Tucker immediately went from Baltimore Ravens kicker to household name on Monday night after his stunning 61-yard field goal sailed through the uprights to seal their 18-16 win over the Detroit Lions. What does a man get for making six field goals in a game? Apparently, a bunch of free soda. Well, he followed that up by being a guest on The Peter Schrager Podcast to discuss the kick, his love for opera music — the man can sing opera in seven different languages . . . yes, seven (scroll below for visual evidence) — and the outpouring of support he received after the field goal. In fact, his cell phone battery died because of all the text messages he received. Schrager was also joined by Josh Charles of ‘The Good Wife’ to talk his Ravens’ fandom. And for those who paid close attention above, we’re not kidding about the opera thing. The man’s got skills . . .